An average person in Uganda would suggest boiling as the way to treat water for drinking. While this is true and also widely applied, it is not the least costly alternative. It is also not the most environmentally sustainable. 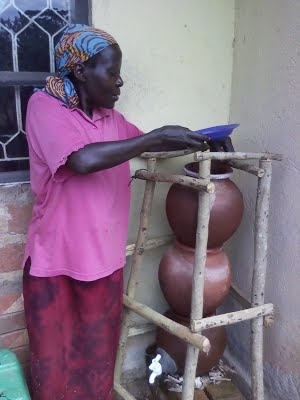 90% of Ugandans use wood-fuel for cooking. Some of them of-course drink untreated water. Those who actually boil their water use 1kg of firewood to bring one litre of water to boiling point. For a family of 6 assuming the recommended consumption of 3ltr per person a day, this translates to .... litres per day. Meanwhile the Ministry of Water and Environment decreed a 3 month ban on timber harvesting due to the alarming rates of deforestation. It will be argued that wood-fuel for drinking water is not entirely responsible but at an estimated ..... kg per year its toll cannot be ignored. A parallel can be drawn with city-some dwellers who may use electricity or gas to boil their drinking water. They are then over burdened by the high gas or electricity bills. Advances in scientific knowledge have presented several less energy intensive and cheaper alternatives. Some of these are approaches or technologies such us; solar water pasteurization, chlorination and filtering using bio-sand, three pitcher or ceramic filters. Upper Kauga , Prison Road, Mukono.